The World Bank should consider appointing a non-American as its next president, according to a leading voice from the developing world. The current head, Robert Zoellick, has said he will step down on 30 June. By tacit agreement, the job has always gone to an American. But Ngozi Okonjo-Iweala, Nigeria's finance minister, told the BBC it is time to open it up to competition and that top jobs at international institutions should be filled on merit. Ever since the World Bank and the International Monetary Fund opened for business after the Second World War, there has been a carve-up over appointing their leaders. It was an informal agreement, but an effective one nonetheless. The Bank would be run by an American, the IMF by a European. More than 60 years on, that remains the case. Mrs Okonjo-Iweala, a former senior executive at the Bank, told the BBC's Business Daily that "times have changed and I think the way the positions are filled should change along with it". The decision will be taken by the Bank's board and it has issued a statement saying the selection process will be "merit-based and transparent". But votes are weighted roughly in line with subscriptions to the agency. The US accounts for nearly 16%, and the three largest European Union nations have close to 14% between them. Mrs Okonjo-Iweala says that arrangement too is ripe for change: "You need to change the weights within the institutions to reflect the modern world." 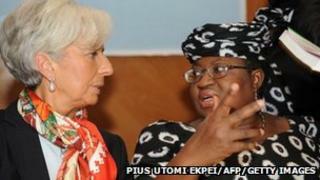 She is full of praise for the current leaders of both agencies - Mr Zoellick and Christine Lagarde at the IMF. But she argues there are candidates from developing countries who are well qualified and could do the job, although she won't name names. There are, however, some obvious possibilities. Several were mentioned when the IMF recruited a new managing director last year, including some former finance or economy ministers; Trevor Manuel of South Africa, Kemal Dervis of Turkey and Agustin Carstens of Mexico, among others. When I told Mrs Okonjo-Iweala that she seemed well-qualified, she laughed and said"this isn't about me". But the US has said it will nominate a candidate. There has been speculation that it might be Secretary of State Hillary Clinton. Whoever it is, Europe has an incentive to support them in the hope the US will back a European the next time the IMF job comes up. Mrs Clinton or any other American candidate will be hard to beat.